The new Centrif Plus is a range of two-speed 100mm centrifugal extractor fans designed for kitchens and utility rooms. Sleeker and quieter than the previous model, these fans extend the thinking behind the Vent-Axia Solo Plus to a larger, more powerful yet equally unobtrusive product. 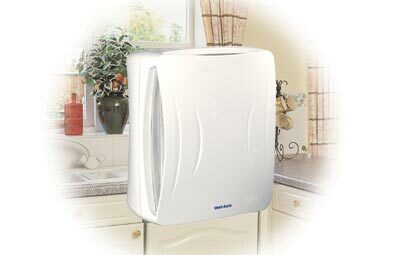 An easy to clean filter and competitive pricing makes Centrif Plus an excellent addition to the Vent-Axia range. Available in two performance options, Centrif 250 is for kitchens and the Centrif 170 for utility rooms and large bathrooms. The range consists of a basic version - timer, humidistat and pull cord and 2 speed, pull cord or remote switch models. All models have trickle speed option. All models feature an easy to remove front panel secured by integral spring release catches. Metal washable filters are located on all sides of the front casing. These are not removable and must be washed while in the front casing. A safety interlock device isolates the fan when the front cover is removed for added mechanical safety.